With more than 5,600 employees, Riyad Bank takes pride in being amongst the Saudi organizations with the highest national employment rate of 93%. Mobilizing its substantial capital base and with decades of expertise to assume a leading role in all areas of Saudi finance, Riyad Bank is a leading financier and arranger of syndicated loans in the oil, petrochemicals and most of the Kingdom’s notable infrastructure projects. On the retail front, Riyad Bank’s individual solutions are designed to meet the needs and requirements of all economic segments. A series of meetings were held to gather the bank’s requirements for the new ATM interface and a Requirement Specification Document was written. The fonts used for the icons also had to be within guidelines. An orientation session of all the current screens was conducted by Riyad Bank. A soft copy of the existing screens and corporate guidelines of the new theme were provided. 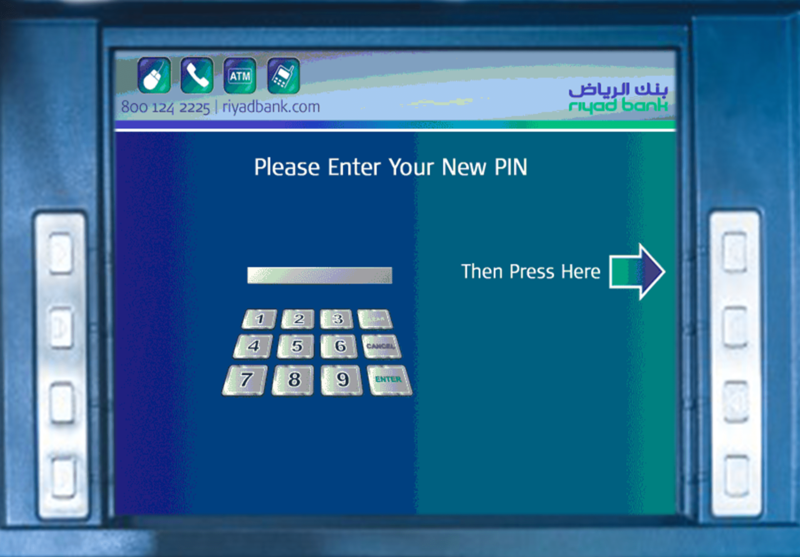 415 screens were to be designed for Diebold and NCR machines, in both Arabic and English languages. The specifications of each type of machine were provided. A visit of EBOX® to the Quality Control (QC) department was arranged to provide a demo for the workflow of the bank’s current ATM screens. The screens were divided into 3 categories – static, dynamic and common. A timetable was defined for the various project phases, coordinators were assigned from both parties and responsibilities of each party in each phase of the project were determined. A project plan was created to be in line with the project timeline. A limitation turned into a challenge! 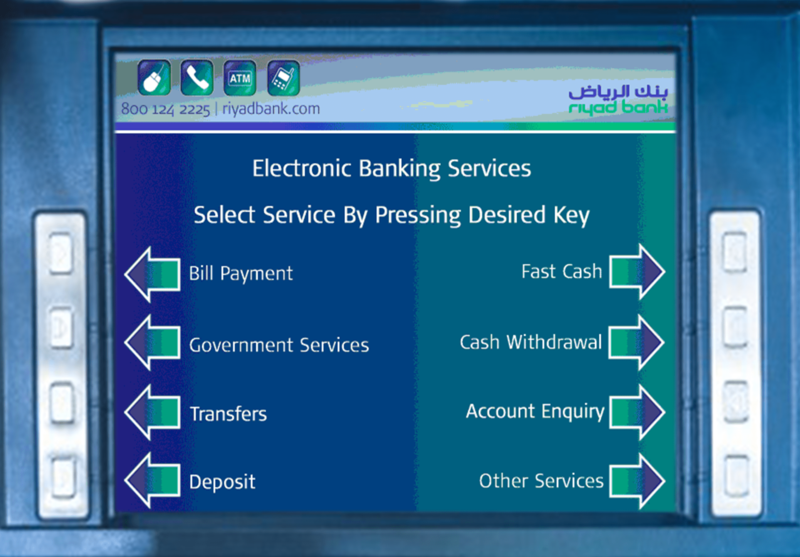 Full functional and graphical specifications of ATM Screens were written – screen size, type, resolution, screen flow, numbers, extension, animation and layout. The new design was to be aligned with the desired product tone based on Over-arching Riyad Bank Communication strategy but with added feeling of: Logo Exclusivity/Modernity, Privilege, Professionalism/Courtesy, Best Quality and At Your Service. The first screen (i.e. 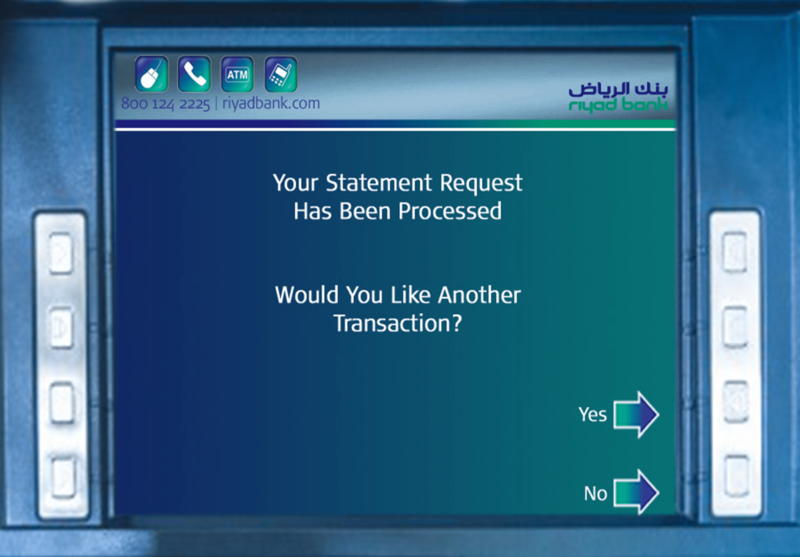 idle screen with a rotating 3 dimensional image – to prevent screen burn) was to be designed based on the Riyad Bank logo and color scheme – per the brand guidelines).The remainder of the screens – any possible combination – were to have the RB logo and color scheme with a background picture (to be provided by RB). The icon colors were to be chosen from the RB brand guidelines. Two designers and two Riyad Bank employees were appointed for this phase. Based on the corporate guidelines indicated by the bank, the creative team started designing different elements and their corresponding screens. PowerPoint presentations were created which contained 7 different interface design concepts for Diebold and NCR ATM machines for the client to choose from. After improving the concept based on client feedback, the screen flowchart was provided to proceed to the Design phase. The first screen (i.e. 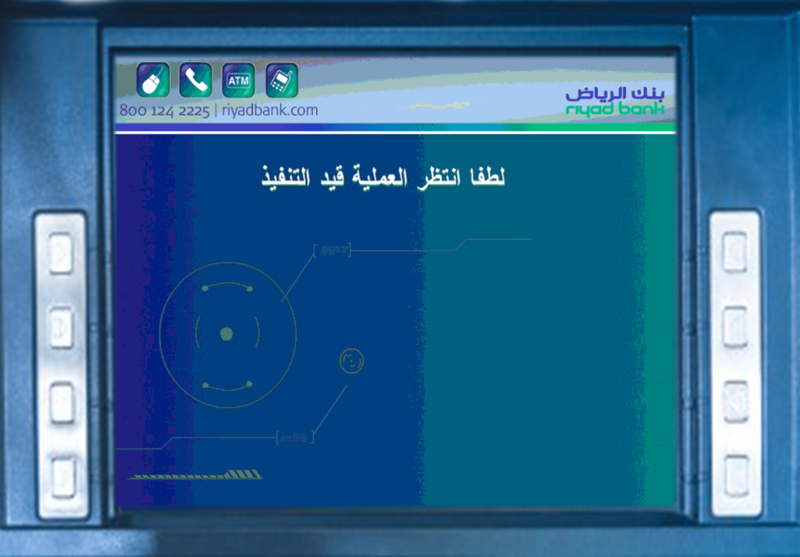 idle screen with a rotating 3 dimensional image – to prevent screen burn) was to be designed based on the Riyad Bank logo and color scheme – per the brand guidelines). The remainder of the screens – any possible combination – were to have the RB logo and color scheme with a background picture (to be provided by RB). The icon colors were to be chosen from the RB brand guidelines. The screens were first deigned in English and then in Arabic for both Diebold and NCR machines. New corporate user interface elements such as buttons, backgrounds, alert messages, pop-ups, progress bars, etc. were designed based on the bank’s corporate style guide. 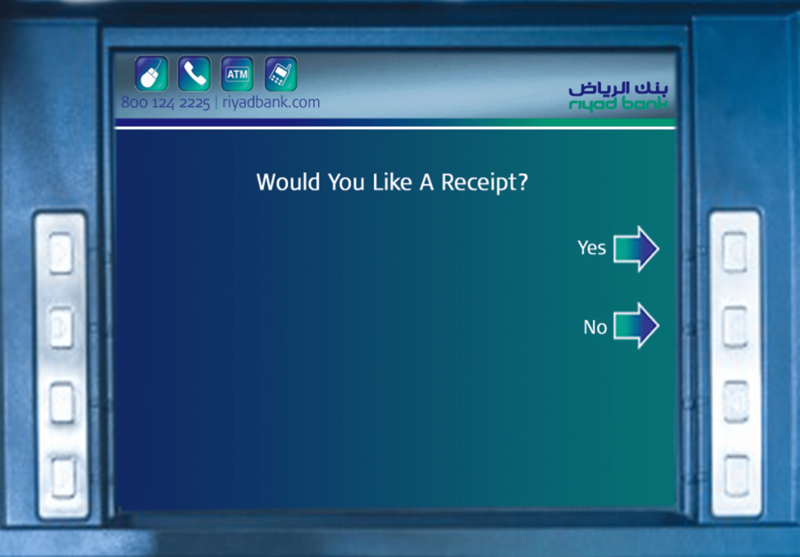 830 screens were designed in total – 415 for Diebold machines and 415 for NCR, in both English and Arabic languages. The designs were in PCX, GIF and JPEG formats. 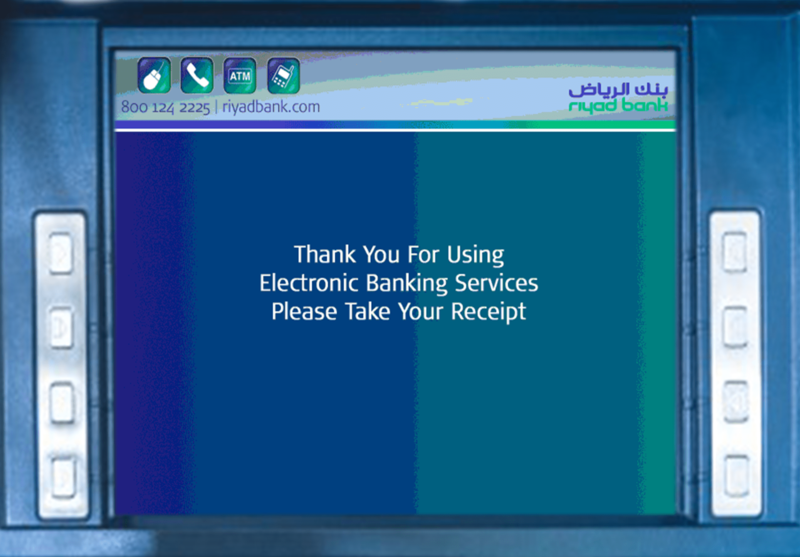 The screens were of 3 categories: Debit, International & Other GCC Cards. Several 5-second long animations were created for the animated screens to demonstrate steps involved in withdrawing cash from the ATM machines with the new interfaces. These included entering the PIN number, entering the amount to be withdrawn and receiving the cash and receipt. The background of the animated screens was made consistent with the static screens. The concepts & movies were improved until we reached the final design deliverables. Some animations with .gif and .swf extensions and design concepts with .pcx, .gif and .jpg extensions were sent by EBOX® ® as samples to be tested on ATM machines. Once the interfaces had been developed, we moved on to the Installation and Integration phase. 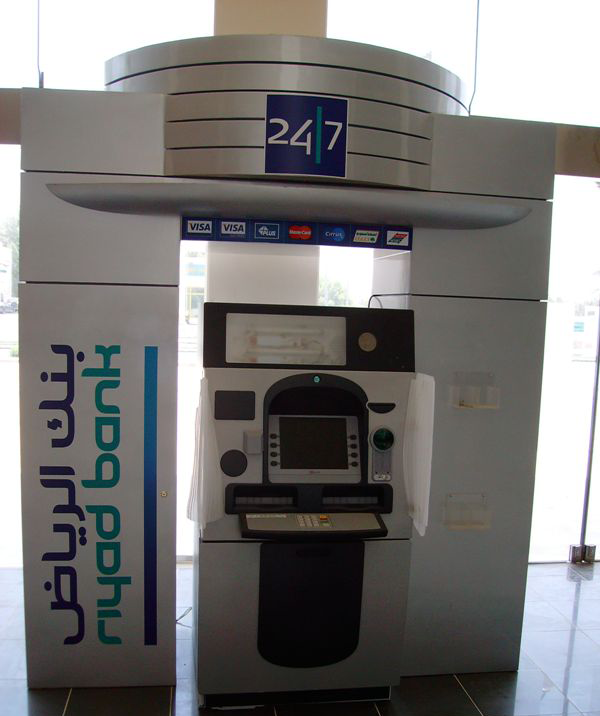 The interfaces were installed integrated on the datacenter of Riyad Bank ATM machines in the QC Lab. It took a month to test the screens in the QC Lab. Some issues encountered with the Diebold screens required machine adjustment and resaving of all dynamic screens but our expert team managed to deliver the new screens in two days. 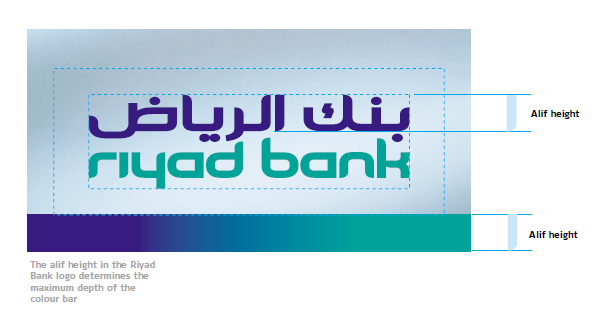 SIT Testing was carried out by Riyad Bank for 5 business days. A documentation was provided to assist with the testing. A Defects Report of ATM Screens was sent to EBOX® in which all defects faced were documented, along with the priority and severity of the issue. EBOX® then appointed two developers to resolve the reported issues. Isn’t it cool to get a cash in your own design?! How lucky we are to get the chance to ! A training session was held to give Riyad Bank delegates an overview of the basic features of Adobe Photoshop ME 7.0 to enable users to add new RB screens or update the existing ones. 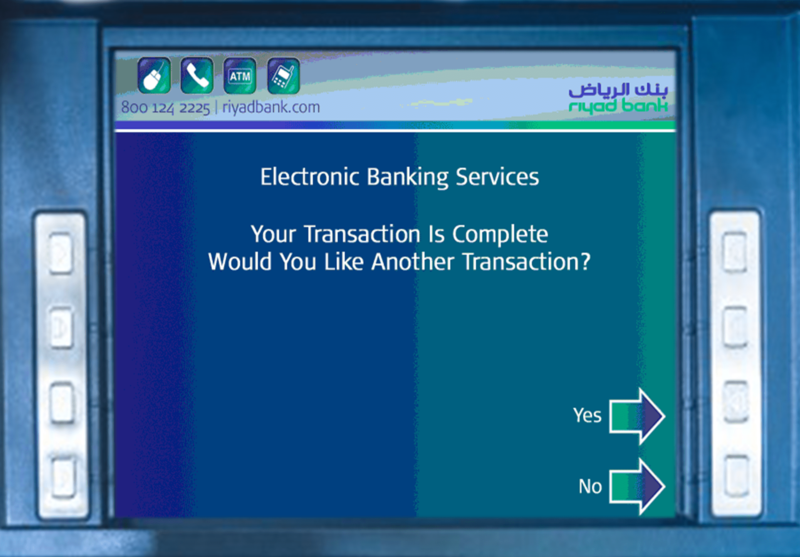 A Training Documentation was written which described image file formats which had been used for both Diebold and NCR machines, explained how to view, add, duplicate and delete layers; formatting used for both English and Arabic text and tools which had been used in designing the screens. The PSD files of the project were handed over to the client. 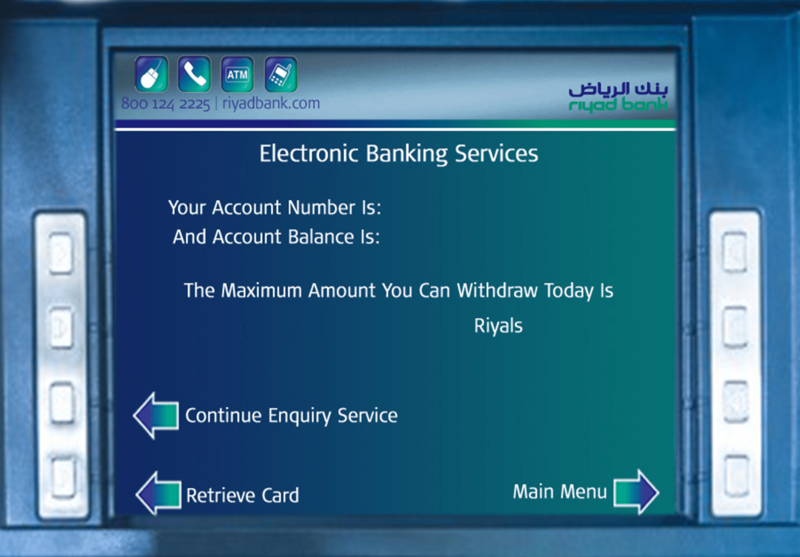 EBOX® proudly announced the launching of Riyad Bank ATM screens in Nov 2006. The project were fully designed and implemented by our creative and dedicated staff. 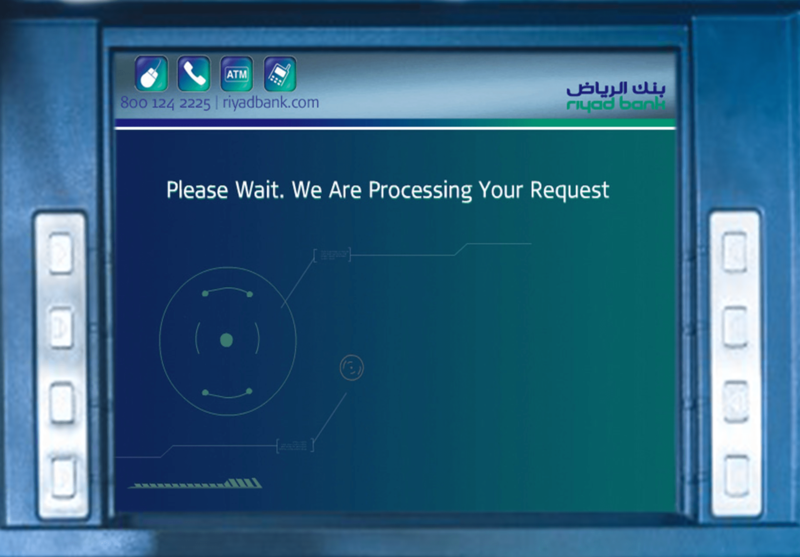 We ultimately delivered the awesome designs in full to the Riyad Bank on time and it was compliant with all of the rules and legislation that the Bank body itself had to abide by. Our tremendous efforts were complimented by an invitation to a celebration arranged by the Riyad Bank team. The new designs were a roaring success and reached millions of people in the local market. EBOX® has used multimedia in the design of the screens, they are more friendly, with a great look and feel, we are sure you have noticed the difference. Even though my interaction with EBOX® was very little through EBOX® involvement to the design and implementation of ATM dynamic screens, I have found EBOX® deliverables of professional and great quality. EBOX® was brought by Riyad Bank as an alternative to a British Company at the time and has proven that Saudi women work force can compete with very high standards at a reasonable cost. 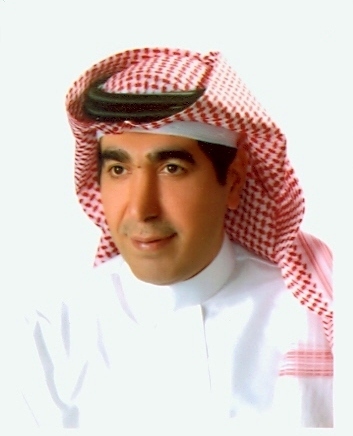 I was impressed to find that EBOX® has the structure, knowledge, SMEs, and the competency to be challenged against aggressive time to market set by their client who happened to be Riyad Bank at the time. It was great to find a local and professional alternative that is delivery oriented and eliminate being monopolized by foreign IT firms.